well before we move to the assembly phase, a quick look at the three choices we had while thinking about the struts. 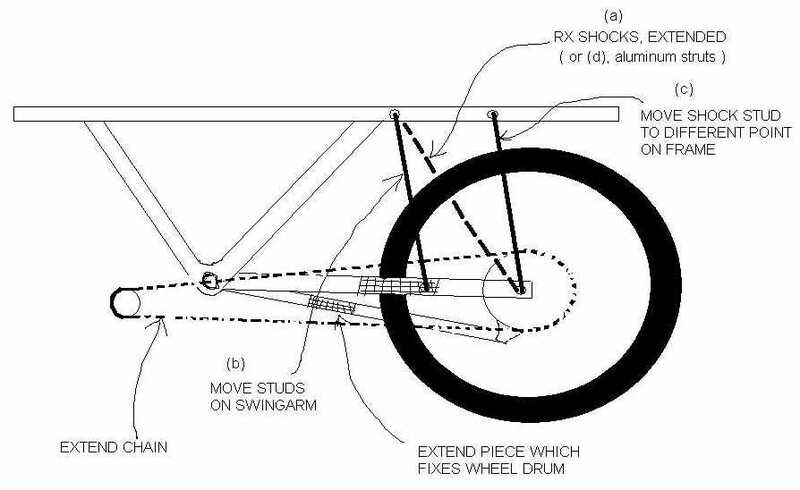 we could either move the upper mount point on the frame further behind, or two, move the lower mount point forward on the swingarm, or three, keep everything as it is, and depend on longer struts to bridge the new distance between the stock shock mount points. the first two options involved further welding etc, and so were quickly discarded. as you can see from the pic, at one point we actually thought of using RX shocks. i think the reason was weight reduction. well, those aluminium struts turned out better, saving 750g each in weight - ie, 1.5kg between the two (if i remember correctly). 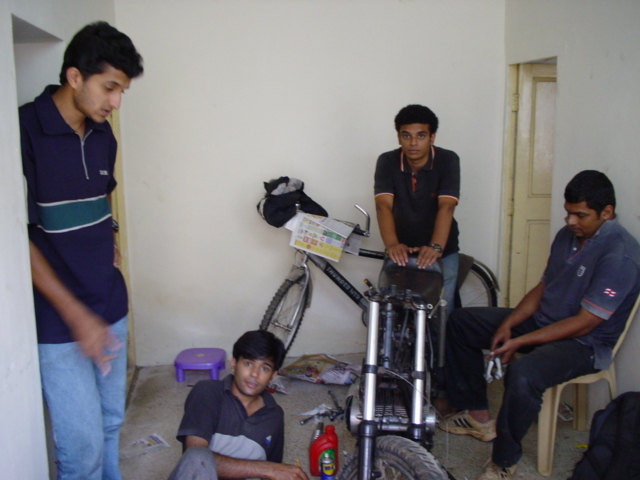 anyway so thats that and we ensure that the front end as well as the rear wheel assembly is in place correctly and that everything is aligned fine. 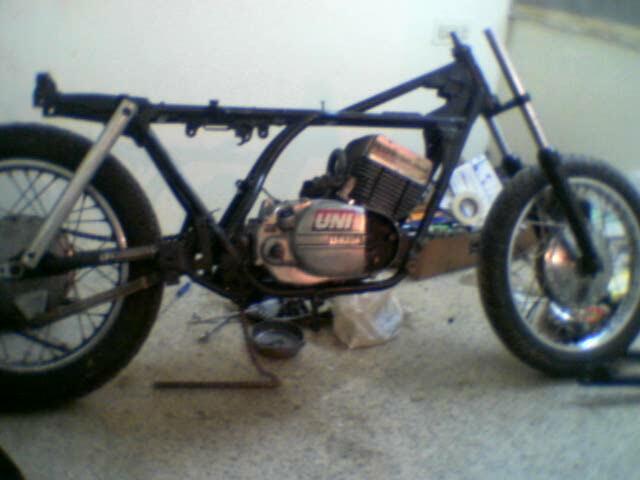 next step obviously is to get the engine onto the frame and that what we do. its not a difficult job as such, just a rather, er heavy job. 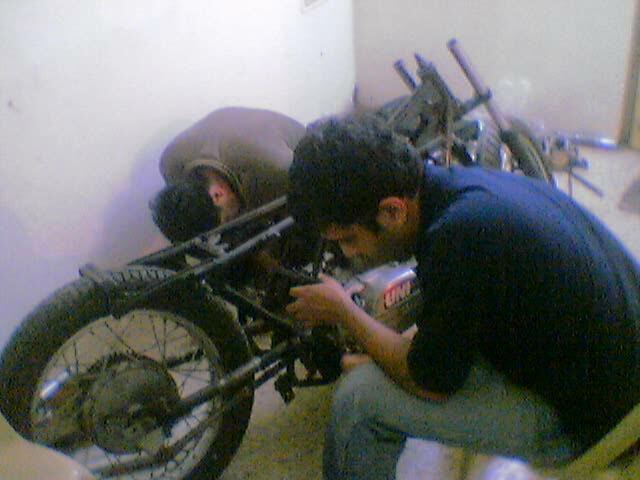 tighten the three engine bolts (the fourth one, the one on top - ron asked us not to use that. something to do with vibration issues) and thats done. 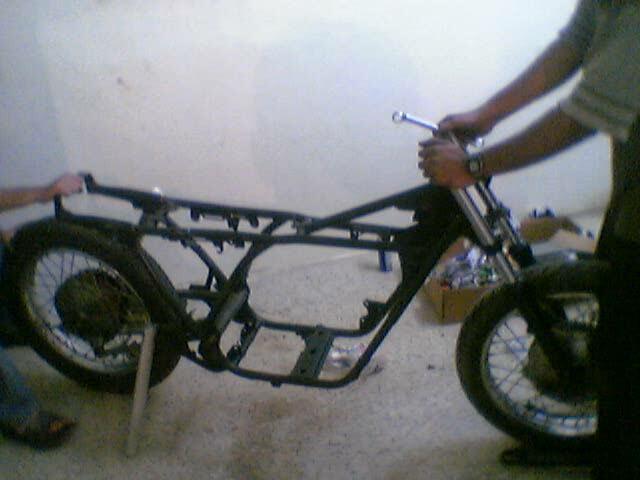 with the engine on the bike we stand back and take a look - and doesnt she look look really long now. thanks to those extra 4 inches. so by now most of the heavy work is done and the rest is more about completing the rest of the jigsaw puzzle. soon killer and crank drop in and we have company. i suspect we got stuck at some point then - at least the looks on everybodys face says so. but dont remember what the issue was. there were no major blocks anyway and we move on.